The RNLI's new Shannon class is a ground-breaking design that is a generation ahead of our existing Mersey class lifeboat in technology terms. Designed to reach emergencies more quickly and more safely than its predecessors, it is the first RNLI all-weather lifeboat to be powered by waterjets rather than conventional propellers, giving it speed, shallow draft and unprecedented agility while still being able to cope with the roughest of conditions. The Shannon is fast - up to 25 knots in suitable conditions which is 50% faster than our current Mersey and a match for the station's small D-Class IB1 inshore lifeboat. This will help us reach vessels in distress along the coast sooner, in particular at Brancaster and Blakeney and to get to fishing vessels, yachts or work boats off-shore more quickly. As an example, it normally takes us nearly an hour to reach an emergency near the Sheringham Shoal windfarm but we can be there in under 40 minutes in a Shannon. In addition to the boat's speed, the Shannon's advanced Supacat launching carriage is effectively a mobile slipway and will be able to launch the lifeboat from a wide variety of locations, possibly saving the two mile trip to Holkham beach that our current Mersey must sometimes undertake to launch at low water. The Supacat's built-in turntable also allows the boat to be recovered and re-launched in around half the time of the Mersey which could save vital minutes if the boat is needed again soon after returning from a service. The Shannon's hull design and water jets means she can operate in shallow water... indeed, we'll need less depth than many leisure yachts and fishing boats. This might make a vital difference close in to the harbours, beaches and sandbars that feature in our local area, allowing the boat to work right into to the shore or get closer to or even alongside stranded vessels to take people off or put crew, equipment or a towline aboard. The water jet propulsion system provides incredible control and versatility when manoeuvering the lifeboat close to casualties or hazards. The Shannon can spin on the spot, glide sideways out of a tight space or stop dead from top speed in little more than her own length. These may sound and look like 'party tricks' but show the control the coxswain will have to precisely position the lifeboat to allow people to be taken off damaged vessels in difficult conditions or to be able to safely coax a disabled vessel under tow into a berth or simply to get clear in a hazardous situation. Shock-mitigating seating is designed to protect the crew at speed during rough weather. This isn't about making the boat comfortable so much as ensuring that the crew aren't hurt or injured and arrive on-scene able to do their job. Indeed, much of the Shannon's design is meant to provide a safer and more effective environment for our crew to work in... fewer steps and trip hazards, a larger aft deck space and better stowage for equipment. Introduced with the Tamar, the RNLI's Systems and Information Management System provides all crew members with a multi-function computer display so that many tasks, from radio to radar to navigation to monitoring the boat's engines and CCTV, can be controlled by touch-screen from any of the crew's seating positions. It makes it easier to share tasks and helps the crew stay safely seated in rough weather while providing better information about the boat and task in hand. The Shannon includes a recovery davit on its starboard side, allowing the crew to easily lift a person in the water on-board, a feature usually only found on the larger all-weather lifeboats and a task which is often difficult with our existing Mersey class lifeboat. When the tide is out at Wells, we need to take the lifeboat to the sea in order to launch it... as much as a two mile journey across the beach to get to the water's edge. For this reason, our lifeboat has always been on a carriage, initially pulled by horses and later by tractors and our current tracked Tallus. The Shannon will be no different except her launching carriage is just as much an innovation as the boat itself. The Supacat carriage (or SLARS, Shannon Launch and Recovery System) works as a single tractor and carriage unit, with both the tractor's and carriage's tracks being driven to allow it to drive across uneven and soft ground without bogging down. At the water's edge, the carriage bed can tilt, allowing the Shannon to be launched slipway-fashion in a wider variety of locations than is practical for the Mersey. On return, the Shannon can, if necessary, beach itself at speed to get clear of any surf or breaking waves and the Supacat can then pick the boat up directly from the beach - unlike the Mersey where our shore crew must work hard with skids to reposition the boat for recovery. Once winched up from the beach, the Supacat carriage revolves 180 degrees so that the lifeboat is repositioned ready to be relaunched. A new boathouse will be built on the beach at Wells-next-the-Sea for the Shannon and its launching carriage as well as the inshore lifeboat, Softrak launching vehicle and crew and workshop facilities. The existing building is a much-loved and distinctive feature of the town but is nearly 120 years old, albeit with many revisions and extensions over the years. It's showing its age (although it survived an exceptional pounding in the December 2013 storm surge remarkably well) and is unfortunately not big enough to accommodate the Shannon and her launching equipment. These shore works will bring the RNLI's new investment in continued life saving provision at Wells to an estimated £5.5 million. Work on the new boathouse is expected to start in 2016 so that it is ready for the arrival of the new boat. 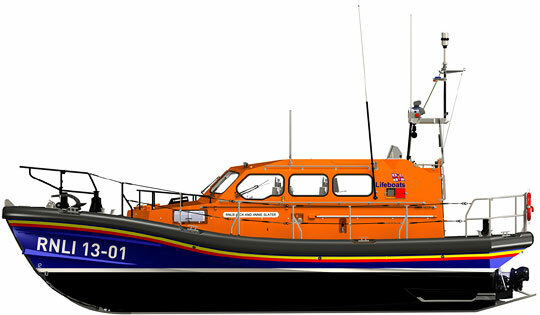 Wells is one of 17 RNLI stations currently scheduled to receive a Shannon lifeboat in the next few years. Dungeness and Exmouth have already received the first Shannons to go on service on the coast. In total, the RNLI intends to build over 50 Shannons to form the mainstay of its all-weather fleet, while upgrading existing Severn class lifeboats and eventually building more Tamar lifeboats. Shannon class boats will replace Merseys and also go to some stations that currently operate the larger Tyne class boats (the Shannon is said to be as sea kindly as the larger boat). This will eventually lead to all of the RNLI's all-weather fleet being capable of 25 knot speeds. Shannons will be built at a rate of five or six per year at the institution's own construction facility in Poole, the new centre being designed to allow the RNLI to ensure quality and control costs in manufacture.